After Los Angeles lawmakers decided to increase the city’s minimum wage to $15 per hour, many were bewildered by the recent push by unions to create an exemption in the law for firms that have a unionized workforce. In other words, the same labor unions that fought hard for the so-called “living wage” would like to exempt themselves from the law and the ability to negotiate wage rates lower than $15 per hour. While it may seem odd, these exemptions are actually quite common in local minimum wages. San Francisco, Chicago, Oakland, and SeaTac all include union worker exemptions in their minimum wage laws. So then the natural question is why would labor unions, who are among the largest advocates of local minimum wage laws, want to exempt themselves from those very same laws? One reason could be that exempting themselves from minimum wage hikes likely helps unions increase their bargaining power. It is no secret that unions have struggled to gain membership over the last three decades. From 1983 to 2014, the percent of the workforce who are union members has fallen from 20.1 percent to 11.1 percent. 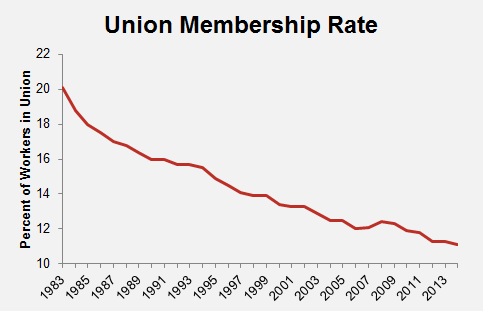 The declining union membership is detailed in the following chart. Evidence also suggests that as unions lose members they are increasingly struggling to gain new membership. According to a Bloomberg BNA report, the number of newly unionized employees tumbled between 2013 and 2014. In the first half of 2013, almost 66,000 new workers were unionized through National Labor Relations Board elections and during the first half of 2014 that number plummeted to roughly 26,000. So how would exempting union members from minimum wage laws lead to more union members? These exemptions raise the cost of hiring non-union workers relative to union workers. If the $15 minimum wage in Los Angeles were to apply to everyone but employers with unionized workforces, the cost of labor increases for all workers except those in unions. With union workers now less expensive relative to non-union workers, employers would be more willing to engage in collective bargaining and employ union workforces. A fast-food restaurant, for instance, might be more willing to employ union members who are able to negotiate for wages below $15 per hour. Hence, union membership would grow. Research also suggests that, contrary to intuition, these union exemptions from local minimum wage hikes may actually increase union member wages. That’s because the increased incentives for employers to hire union workforces enhances union bargaining power. This as a result leads to higher wages for union members and increases the benefits to workers of joining a union. 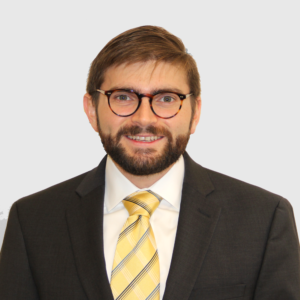 Economist David Neumark examined this phenomenon by studying the impact of a specific form of “living wages” that apply only to city contractors. These laws require for any business that contracts with the local government to pay their workers at least a certain minimum wage set by the city. These laws, meanwhile, did not apply to unionized municipal employees. Neumark hypothesized that “by raising the wages that city contractors would have to pay, living wage laws may reduce the incentives for cities to contract out work that would otherwise be done by unionized municipal employees, hence increasing the bargaining power of municipal unions and leading to higher wages for their members.” Neumark indeed found significant evidence that increasing the minimum wage for city contractors by 30 percent results in increasing wages for exempt unionized municipal workers by 5.9 percent. So by successfully advocating for steep local minimum wage hikes and exempting themselves from the new wage floor, unions stand to benefit in relation to both employers and employees. First, when the government increases the cost of the non-union workers relative union workforces in low-wage service sectors, employers are more willing to engage in collective bargaining with unions, which helps lift union membership. Second, when firms are more willing to employ union workers, union bargaining power rises, which in turn allows for unions to negotiate for higher wages. In turn, these higher wages increase the incentive for workers to become union members. Meanwhile, non-union workers are entirely burdened with the cost of the minimum wage, which evidence consistently shows is a dismal antipoverty tool and hurts those it aims to help.